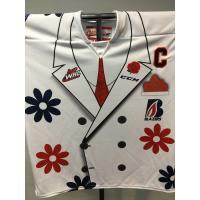 Kamloops, BC - The Kamloops Blazers will be wearing special edition Don Cherry themed jerseys for the second annual Re/Max Presents: WHL Suits Up with Don Cherry to Promote Organ Donation on Friday, February 1st versus the Prince George Cougars. Six jerseys will be given off the players back on Friday, February 1st with the remaining jerseys auctioned online until February 10th. 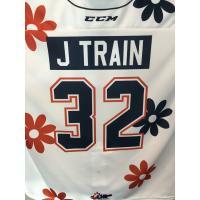 The six jerseys that will be auctioned off on Friday are Jackson Caller, Logan Stankoven, Zane Franklin, Orrin Centazzo, Connor Zary and Brodi Stuart. Bids will close at the end of the second period. All proceeds from the event will go to the Kidney Foundation of Canada. Last season, the 17 Canadian WHL teams raised $265,500, which was the largest public awareness and fundraising campaign for the Kidney Foundation of Canada. There will also be 1,000 limited edition Don Cherry bobbleheads that will be distributed to fans in attendance.